A new project from the Ghost in the Shell franchise has just been announced! 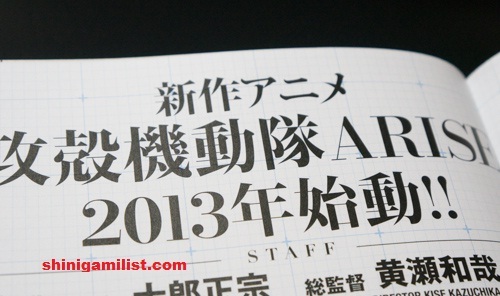 Ghost in the Shell: Arise will be coming to us in 2013 and it will be lead by executive director Kize Kazuchika from Production I.G. Tow Ubikata will be doing the script. His previous projects include the Mardock Scramble movies and Le chevalier d’Eon series. The main theme song of the upcoming project will be performed by the popular Japanese artist Cornelius. This is a big teaser since it does not give us information about what type of a project this is. It an be both series and movie. The only thing that seems certain is that it is not a Stand Alone Complex instalment. Click images for more information and if you find something you can add to this news – share with us! All images in this post are clickable. This will be something I would love to watch. I like the Stand Alone Complex setting, but still am excited. Well…it was one of my first anime loves, so I can’t wait to hear more. Best news ever…at least for a long time.